Eagle Wind Music specializes in hand made Native American Flutes, Drums, Instruments, and Music. Jonathan Maracle, founder of BrokenWalls and creator of Eagle Wind Flutes and Instruments is a Mohawk from Tyendinaga, Territory in Ontario Canada and a world renown Native American music recording artist. 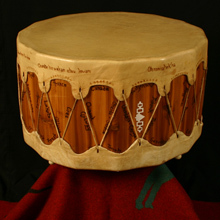 Eagle Wind Flutes, Drums, and Native American music have been sold all over the world and have been featured on many recordings like the one you are listening to now. This flute song is called “The Huron Carol” and was written in the 1600’s. It was featured on an album Jonathan Maracle recorded and produced called “Christmas on Turtle Island” which won the Instrumental Album of the Year at the Aboriginal Music Awards. 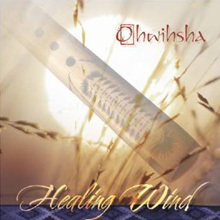 The song features Eagle Wind Flutes, authentic Native Flutes hand made by Jonathan. Tyendinaga Mohawk Territory in southern Ontario, Canada, is where Eaglewind Flutes are created by Jonathan Maracle and his family. Jonathan is a member of the Mohawks of the Bay of Quinte First Nation. As a boy growing up, he and his brothers often helped their father create quality native handcrafts from wood, leather, bone and other natural items. The work they did often sustained their family during difficult times on the reservation. This tradition of craftsmanship has long been a part of the Maracle family and is something that Jonathan and two of his brothers, David and Thomas, take very seriously. All three brothers have won various national and international awards. 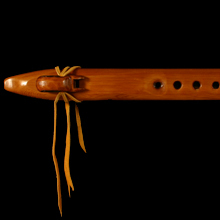 The Native American Flute is an instrument that was created in North America by the Indigenous people of the land. 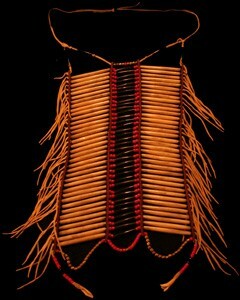 It has been a part of the Native American culture and heritage for centuries. Among certain nations, a young man would use a flute song to woo a young lady. These were called courting flutes. It became more widely used as it was traded along the moccasin trade routes of old. Craftsmen from different Native nations began creating flutes from the types of wood that were available in their particular regions. That is why today you can find flutes in all shapes and sizes, from many different types of wood. They often represent the personality and character of the people group they come from and each have their own unique tone and sound. Most of the earlier flutes were constructed with five holes which followed the melodic progressions of the early songs that were sung. To facilitate the melodies of today’s music, Jonathan prefers to make flutes with a 6th hole. This additional hole opens the door for a much wider variety of notes that can be played. Some flute makers will tie a piece of leather around the flute over the 4th hole to give the option of playing the old style melodies on the new flute while still having the sixth hole available to use for more notes.